They're not as good as Big Jolly's, but that's a high hurdle to clear. I’m Cajun, so cooking is a bit of dis and a bit of dat as my late step grandmother used to say. 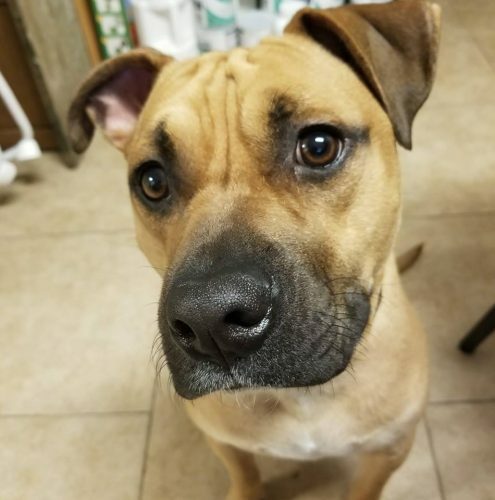 This makes giving an exact recipe difficult, so pictures are in order. To begin with, as always remove the silver skin on the back of the ribs. (Not pictured.) You know it’s no good when even the dog won’t eat it. 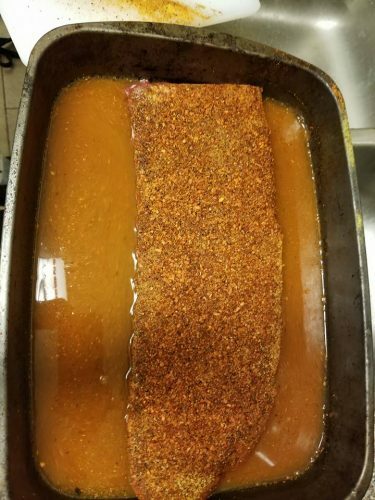 This is a low and slow oven bake – 250 for four hours so it starts with a liquid to seep into the meat. In this case, soy sauce, but any liquid will do. 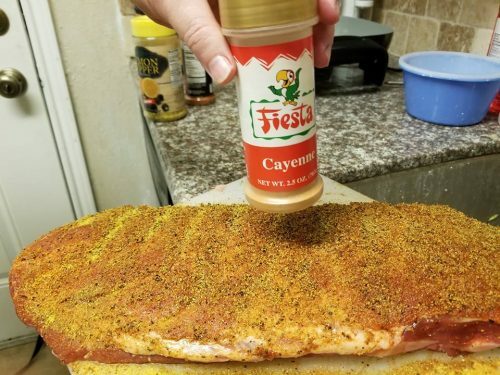 Apply a generous amount of liquid and rub it into the meat to help create a moist layer under the seasoning. Once the moist layer has been applied it’s time to start with the seasoning. 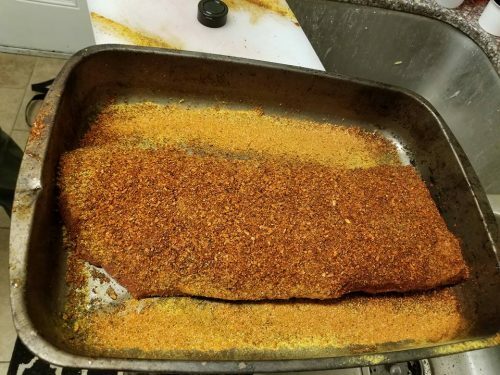 The spicy seasoning is applied before cooking, and the sweet comes at the end by adding brown sugar for the last 10 minutes. 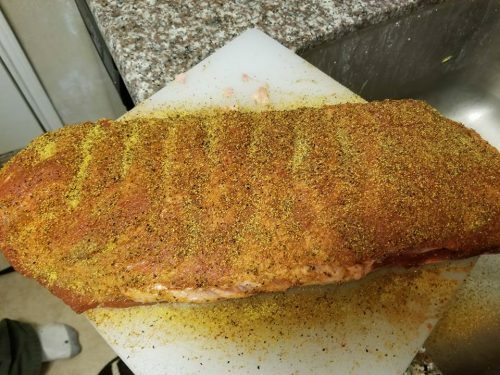 To begin with, start with the rib rub to achieve a nice base flavor. Any rub will do, but given the spicy flavors to come a smoky or sweet base is better. 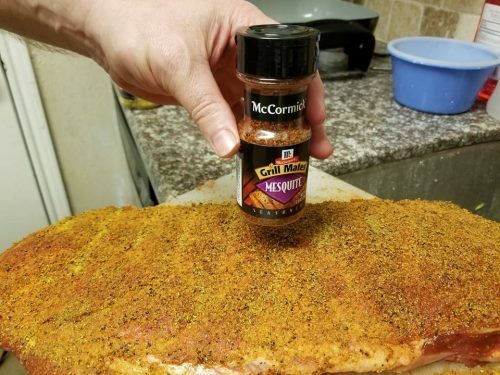 Here I used McCormick sweet and smoky, but the rub doesn’t matter. 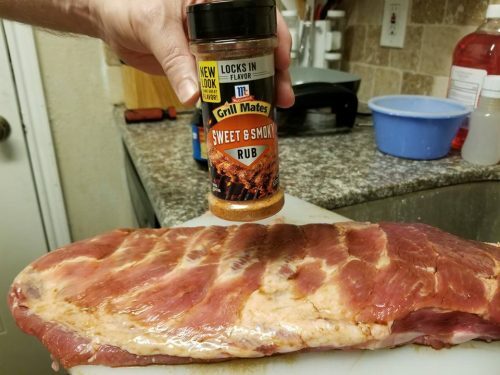 However, it’s better not to use a rub with a “spicy” flavor as you run the risk of having the ribs too hot to eat, or having to add too much brown sugar and it not browning into the ribs at the end. 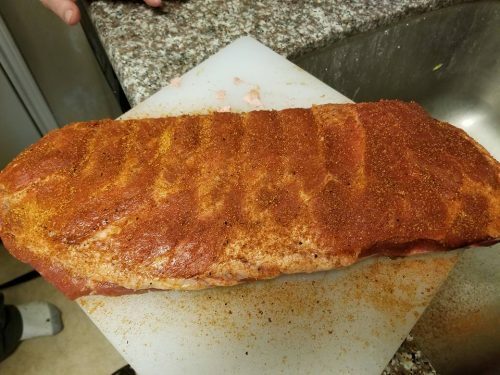 You don’t need as much rub as normal for ribs. As always, rub it in after applying the seasoning. Next is lemon pepper. The more lemon and less pepper the mixture the better. This will be far and away the thickest coat of seasoning. 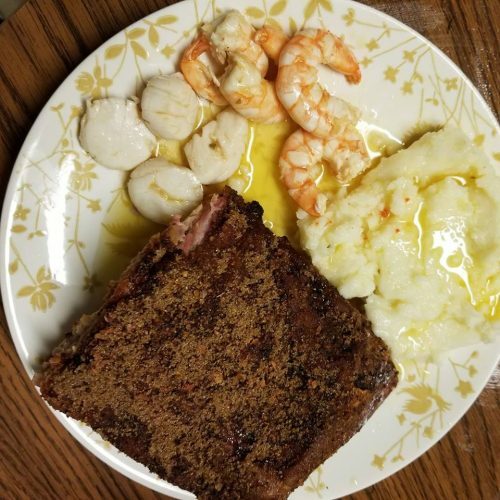 If someone knows of a way to get lemon juice to cook in rather than lemon pepper that would be even better, but I’ve never had the juice leave a hint of lemon taste so use the lemon pepper. Note: don’t try to add lemon juice on top of the brown sugar at the end. That doesn’t work well, and the ribs come out too tart for comfortable eating. Sometimes I will add a layer of Tony Chachere Creole seasoning. 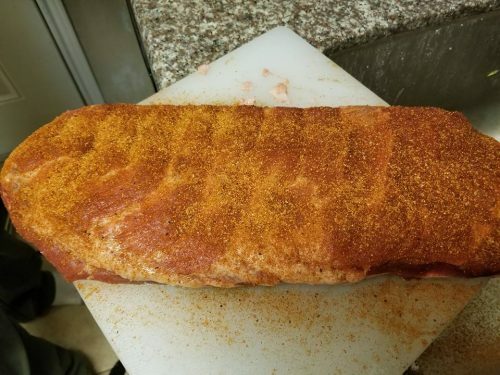 Adding this layer will give the ribs more of a kick. My better half is not a fan of ribs that are too hot and said she will make me drink spinach juice if I added the Tony’s. So this batch has no Tony’s. The next layer is Cayenne pepper. This needs to be a very thin layer. You want to have a hint of heat here without making the heat overpower the lemon. The bulk of the hotness needs to come from the pepper in the lemon pepper. The Cayenne has already been added in the top picture. Finally the mesquite. 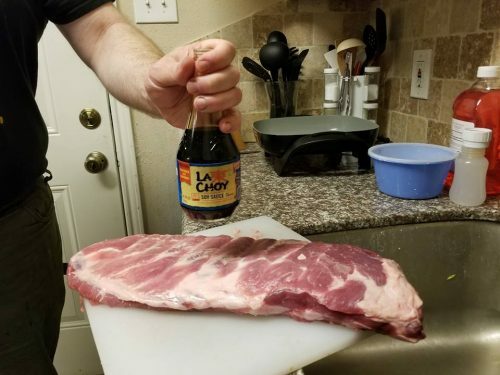 Take a whole bottle of McCormick’s mesquite and cover the ribs. 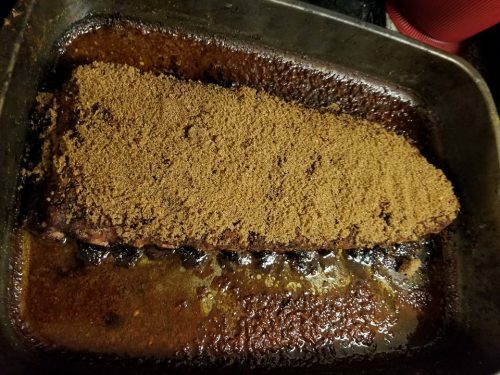 This should be a thick layer to give every bite a mesquite flavor. Since this is a low and slow recipe it affords the opportunity for a bath to let the ribs steam marinate as they cook. 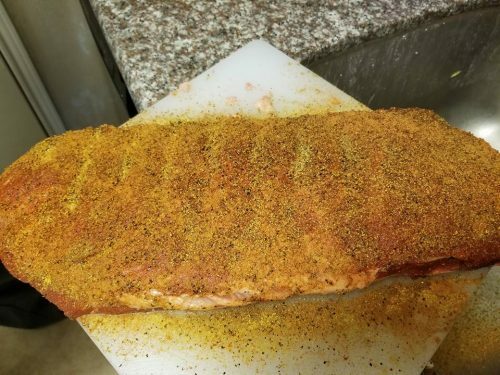 This allows flavor to permeate the ribs as well as keep the ribs moist. Take the same seasoning and pour it in the pan. Then add water to the base of the ribs. Then place the ribs in the oven and set to bake at 250. 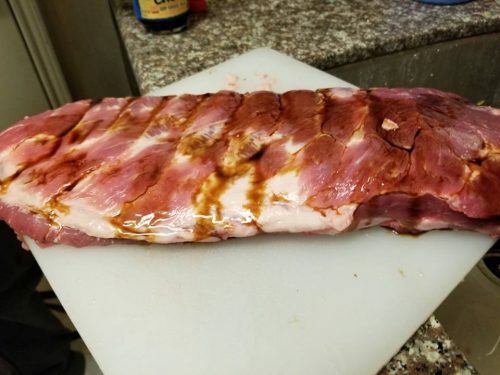 Don’t preheat the oven, but rather put the ribs into a cold oven and let the oven warm the water so the water has a chance to circulate as the oven warms. 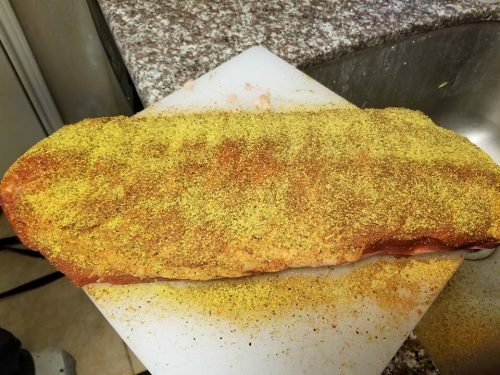 This will mix the seasoning that didn’t dissolve in the bath and make pressing the ribs into the seasoning residue give a more uniform flavor top and bottom side of the ribs. When the over reaches 250 note the time and bake for four hours. 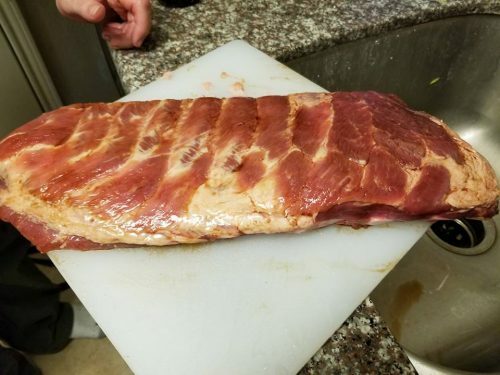 When there’s 10 minutes left, pull the ribs out and add brown sugar to the top, and press the bottom of the ribs onto the residue in the bottom of the pan. Bake for another 10 minutes or until the brown sugar becomes caramel color, but has not yet caramelized. 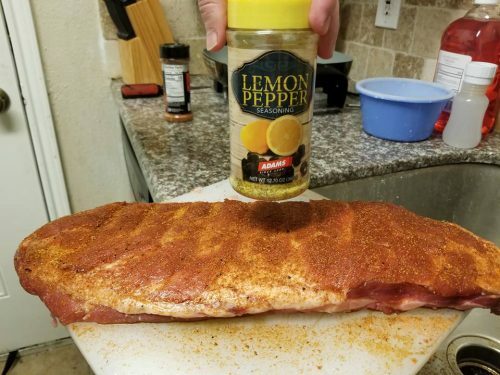 The idea is to have an initial sweetness followed by a heat with hint of lemon flavoring to the ribs. 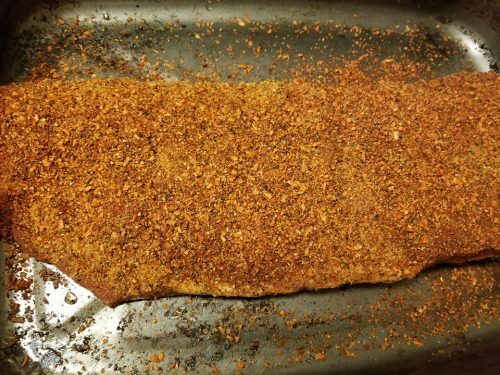 This is a dry rub recipe, no bar-b-q sauce needed.